Every year around this time, millions of people gather at their homes to reminisce about Christmases past. They’ll drink their cocoa, design their gingerbread houses and watch a holiday movie to get them in the mood. Fortunately for these people, the Christmas culture has become an almost inescapable phenomenon and as a result, they’re search for a festive movie on television is an effortless ordeal. Press the “guide” button on your TV remote and you’ll be inundated with everything from new animated specials (which seem to be created solely for the puns) to old classics. Just look at Freeform’s 25 Days of Christmas or Hallmark’s endless selection of cookie-cutter content to pair with your Christmas cookies. These are convenient and comforting to have on while you’re doing online shopping, mulling your spiced cider and serve as familiar reminder of the things that we love about the holiday season: family, snow-speckled small towns, and plenty of Christmas lore. A few of my personal favorite things to watch this time of year are those old Rankin/Bass claymation Christmas movies. Remember those? Well, to tell the truth, you probably don’t need much of a reminder since they’re on two or three times a day. There’s something quaint and charming about watching those old classics from generations past; all the awkwardness and unintentional inappropriateness serves a dual purpose: to mock the hilarious innocent ways of the ‘nuclear-family’ era and to serve as a nostalgic gateway to a simpler time. These are some of the popular tropes which breathe life into what we might consider a Christmas ‘classic’. ‘Classics’ are being created constantly, right? Or at least once in a decade? Perhaps not. All we want is another Christmas movie as amazing as yours George. Though that might require a much longer lasso. What makes a Christmas movie ‘classic’? Is it replayability? Is it popularity? Box office revenue? Good reviews? It’s – of course – all a bit relative. But there are some films which most people would generally consider Christmas classics, like, say It’s a Wonderful Life (Capra, 1946), for example. Films like these have stood the test of time and make regular appearances on television to this day. Each decade from then on produced its own Christmas classic or two, leading all the way up to 2000’s. But we seem to be in an unusually long dry spell when it comes to Christmas classics. I would argue that the last Christmas movies in contention for the ‘classic’ descriptor go back ten plus years to films like Elf (Favreau, 2003), or The Polar Express (Zemeckis, 2004), the latter of which wasn’t exactly a critical darling. Both films carry an air of nostalgia with them, add to the overall Christmas lore and see plenty of television appearances this time of year. Now that’s not to say there hasn’t been plenty of Christmas movies since these two were released, but in terms of a film which will endure the test of time, we seem to be quite lacking. I’m a big fan of holiday movies and take a festive initiative to see every Christmas movie that comes out in theaters every year. A good chunk of these films play off of the ‘wild’ family dynamics that, in truth, each family has to a degree. Films like The Family Stone (Bezucha, 2005), Almost Christmas (Talbert, 2016) and Love the Coopers (Nelson, 2015) utilize a large family, comprised of simple, single-trait characters, to carry the bulk of a dialogue-driven film meant to play on our ability to relate to their ‘wild’ family drama. It’s fun for a bit, but after seeing a movie like this every couple of years, they really start to lose their luster. All of them seem to perform well enough monetarily in their year, but none seem to carry the long-term value that Christmas ‘classics’ do. In addition, these films aren’t really well received, with a good number of them receiving mixed reviews. A combination of these two factors as well as the repetitive nature of these projects causes them to fizzle out of memory the year after they’re released. But these movies aren’t really Christmas movies anyways. They’re family movies which use the holiday season as a convenient setting for gathering even the most obscure relatives. LOOK at the gargantuan cast of This Christmas (Whitmore, 2007)! THESE aren’t even all the characters in the movie. Geez! If you’re not going to get to know all the characters names, how are they expected to have any dimension to them? There’s also a whole slew of movies which use the Christmas season as a catalyst for acting like a college kid out partying homecoming weekend. 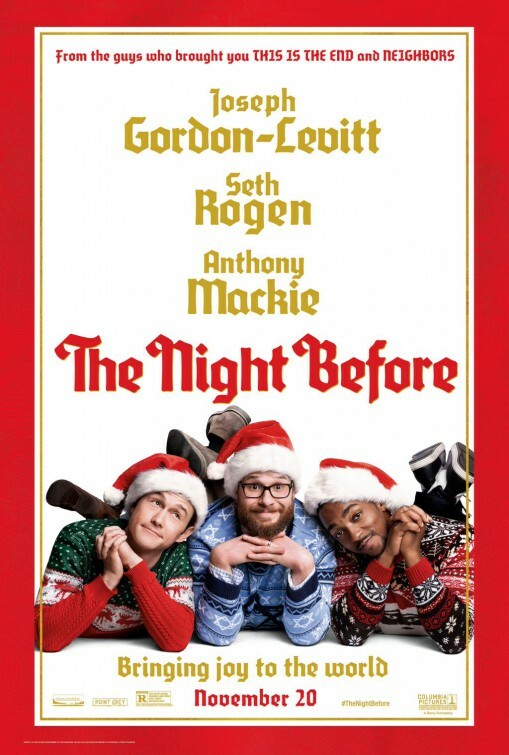 Films like A Very Harold and Kumar Christmas (Strauss-Schulson, 2011), The Night Before (Levine, 2015) and Office Christmas Party (Gordon & Speck, 2016) all provide a ton of holiday-related R-rated puns, but seem to also yield decent box-office performances (though these actually received lukewarm reviews). They are billed to the public as an outlet for that party movie you’ve been craving, just short of a Lil’ Jon shot-taking sequence, that you can watch with your friends/adult family members. And, yeah they’re pretty fun. Instead of simply using Christmas as a ‘setting’, they seem to use Christmas as the plot-anchor, around which the film revolves. These films use the holiday to influence character intentions, create a timeframe for the story and act as a punchline for a number of cheesy jokes. These films are fun and will certainly be favorites for those seeking hearty laughs during the holidays, but they’re still missing an element which prevents them from being a true classic. “What a wild and crazy time!” “These guys sure are doing Christmas differently this year.” In fairness, this is the experience that I want with my old buddies from back home when I go back for the holidays. All of these films appeal to audiences in different ways, some on a nostalgic level and some on an emotional level. These aren’t the only elements necessary to make a Christmas classic, but they seem to be two elements present in many to date. One thing that neither the “R-Rated Christmas movie” or the “family-gathering Christmas movie” capitalizes on is the element of Christmas lore. Going all the way back to those Rankin/Bass films and beyond, people have utilized the opportunity to expand upon the ample Santa universe. Films like Arthur Christmas (Smith & Cook, 2011), Fred Claus (Dobkin, 2007) and even Rise of the Guardians (Ramsey, 2012) play with the Santa universe and Christmas lore, manipulating and shifting certain elements to add fresh perspective to an existing narrative, much in the way that the old claymation films did. It’s all playing on the same basic story, but allows for bringing to life everyone’s fan-fiction. There’s been English Santa (I guess they call him Father Christmas), classic fat-old-white american Santa, and black santa (this version is much better), all inevitably contributing to the mass confusion of the kids today. These films follow a model that would seem to result in Christmas classics, but more often than not, they seem to miss the mark. In some cases, they’re simply playing a note that people have heard too often (i.e. FIVE Nutcracker movies in the last 20 years. FIVE! ), or making things a bit too cartoonish (as in the case of Rise of the Guardians and Fred Claus). But some of these manage to elaborate on this labored universe and add a little heart. This picture is from a Daily Mail article talking about finding Father Christmas’ corpse out in Essex. Truly amazing. Christmas lore has now permeated into the real world as well! Seems to keep consistent with 2016. I saw Elf in theaters back in 2003. At the time, it seemed to be the buzzworthy movie of that holiday season. It had a myriad of quotable moments, an interesting twist utilizing Christmas lore, and perhaps most importantly, a great deal of heart. It was a hit with audiences because of it’s humor and it’s ability to appeal to their emotions. Heartwarming is the trite adjective that might fit here. And now, thirteen years later, it seems to have cemented its place amongst the classics as it’s still in select cinemas every year as a special showing. It’s one of the most played films on Freeform’s 25 Days of Christmas, the UK seems to have a serious obsession with it, and it dominates the ABC6 Philadelphia poll which lists each state’s favorite Christmas movie. Some might say it’s a bit early to call, but already Elf is showing all the telltale signs that it will (if it hasn’t already) joined the classics. Oh man, bless Elf. Favreau didn’t even really have to try and he still made it a favorite for all ages across the world. That was in the golden era of Will Ferrell. But how can a new film like Elf join the ranks of films like Santa Claus is Coming to Town? It added a new element to the world of Christmas lore and most importantly, it did it first. And that’s key. I see films like Fred Claus as an attempt to be the next ‘Elf‘ and failing to do so. Originality is hard to come by in movies these days and even harder so when the parameter of ‘Christmas’ limits you. I think this is why we tend to see these archetypes of Christmas movies begin to form (R-Rated Christmas movies, family-gathering Christmas movies and even longer, niche horror Christmas movies). But every once in a George Bailey, something fresh comes around and strikes all the right chords with audiences, forever cementing itself in cinematic (Christmas) history. I think that’s what happened in the case of Elf and, if the ghost of Christmas future is forgiving, what will happen again in years to come. Elf was funny and sincere, but managed to keep the two elements separate from one another, something other movies should have followed. And yes, Elf does add to the Christmas lore. That also isn’t a necessary element of making a Christmas classic though. Look at Love Actually (Curtis, 2003), a film that many would consider to be a ‘modern Christmas classic‘. It seems to blend together elements of the the previous films that don’t always work (like the “gathering” movies), but somehow has maintained it’s status as a must-watch this time of year. Most notably, it is almost completely absent from mention of any Christmas lore. But it manages to hit the right chords with audiences by utilizing the ‘big group’ element that plays so well in family-gathering movies and combining it with the ‘Christmas as a timeframe’ element that works well for many other films and made something pretty heartwarming. Love Actually doesn’t try to tie together multiple narratives to create one massive character combustion, rather it displays little vignettes of Christmas motifs, much like the Rankin/Bass shorts from decades earlier. It wasn’t a critical hit, buoying just above the ‘Rotten’ threshold on Rotten Tomatoes, but it managed to be unique enough for it’s time that it stands today as a Christmas favorite of many and, despite some R-rated material, finds itself on a network or two around the holidays. Perhaps the quintessential Love Actually moment. Despite it being both adored and detested, it sure does manage to surround you with that cozy holiday feeling. So cozy, the Danish might even say, “Hygge me!“. It’s hard in general to determine which films will stand the test of time, much less which Christmas movies. But there are a number of elements that seem to work, be it an extension of Christmas lore or not. Unfortunately, the films released over the last decade or so have seemingly fallen short of ‘classic’. Sure, you’ll find someone out there who will live and die by Christmas with the Kranks, but that same person will have to pay three dollars on iTunes in the coming decade when something more bearable comes around to take their TV slot. With theater attendance on the decline and a parallel trend in the quality of movies, the small screen comes to seemingly save the day by rehashing the reliable favorites we’ve come to know and love. Remember A Christmas Story? Remember Rudolph? Well they’re on TV alongside every other Christmas movie you want to get nostalgic about. After all, 2016 is the year to remember. Not only does TV provide the movies you remember you loved, but it also provides plenty you will never remember you didn’t, such as all of these Hallmark movies. Oh, help us. But TV can only take us so far. After all, most of the Christmas favorites were born on the screen. Tim Allen, you were Santa! What happened? Oh well. Most audiences will see a trailer with family, snow, lights and a fight over a Christmas turkey and be sold. It doesn’t take much more to get them in the theater. Despite the perhaps pessimistic tone, I do believe that another classic will come along soon. We’ve been in a drought for far too long and, as is the nature of the world today, who knows what’s going to happen? We’ve moved beyond the claymation era and continue to contribute to the Christmas lore. Sometimes it feels redundant, but sometimes, when we’re lucky, they make it work. If there is anything Christmas is known for, it’s miracles – those moments so special, you almost can’t believe they’re real. Cinema has been providing a slew of Christmas miracles since its earliest inception and have gifted us with some of the most precious moments on film. If their magic gives us any hope for the future, the miraculously absent Christmas classic may soon come again. Merry Christmas everyone! Until the next great Christmas movie, we’ll have these guys to hold us over.